ww2dbaseUSS Dragonet was commissioned into service on 6 Mar 1944. She arrived at Pearl Harbor, US Territory of Hawaii and embarked on her first war patrol, but she would strike an uncharted underwater obstacle south of Matsuwa, Hokkaido, Japan in the Kurile Islands, forcing her to end her first war patrol early. 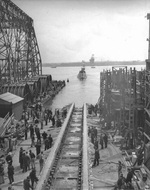 After receiving temporary repairs at Midway Atoll and permanent repairs at Mare Island Naval Shipyard in Vallejo, California, United States, she returned to Pearl Harbor in Apr 1945. On her second war patrol, she acted in the role of lifeguard, rescuing four downed US Army aviators south of Japan. Her third war patrol, which was designated as successful, took her into the Japanese home islands in the final days of the war. She was decommissioned in 1946. 28 Apr 1942 The keel of submarine Dragonet was laid down by the Cramp Shipbuilding Company at Philadelphia, Pennsylvania, United States. 18 Apr 1943 Submarine Dragonet was launched at Philadelphia, Pennsylvania, United States, sponsored by Mrs. J. E. Gingrich. 6 Mar 1944 USS Dragonet was commissioned into service with Commander Jack Hayden Lewis in command. 9 Oct 1944 USS Dragonet arrived at Pearl Harbor, US Territory of Hawaii. 1 Nov 1944 USS Dragonet departed Pearl Harbor, US Territory of Hawaii for her first war patrol. 15 Dec 1944 USS Dragonet struck an underwater obstruction near Matsuwa in the Kurile Islands, Japan (now Matua, Russia) in the morning and flooded her forward torpedo room, forcing her to surface and escape. 16 Dec 1944 USS Dragonet's crew conducted emergency repairs on the bow planes while at sea in the Kurile Islands. 2 Apr 1945 USS Dragonet arrived at Pearl Harbor, US Territory of Hawaii. 19 Apr 1945 USS Dragonet departed Pearl Harbor, US Territory of Hawaii for her second war patrol. 1 May 1945 USS Dragonet arrived at Guam, Mariana Islands. 3 May 1945 USS Dragonet departed Guam, Mariana Islands. 10 Jun 1945 USS Dragonet arrived at Guam, Mariana Islands, ending her second war patrol. 9 Jul 1945 USS Dragonet departed Guam, Mariana Islands for her third war patrol. 17 Aug 1945 USS Dragonet arrived at Saipan, Mariana Islands, ending her third war patrol. 1 Jun 1961 Submarine Dragonet was struck from the US Naval Register. 17 Sep 1961 Submarine Dragonet was scuttled in Chesapeake Bay on the east coast of the United States as the result of an explosion test.